He finally is finished, my crochet mole pattern. He is without doubt the most cartoonish looking crochet animal I have made so far. When I looked at the pictures in this post, I felt happy. 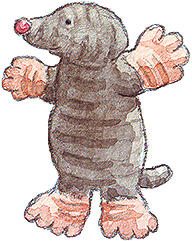 Moser looks like a little digger and resembles a real mole, but he could as well be a character from a children’s book. When I designed him, I kept in mind that moles are not natures most loved creatures. 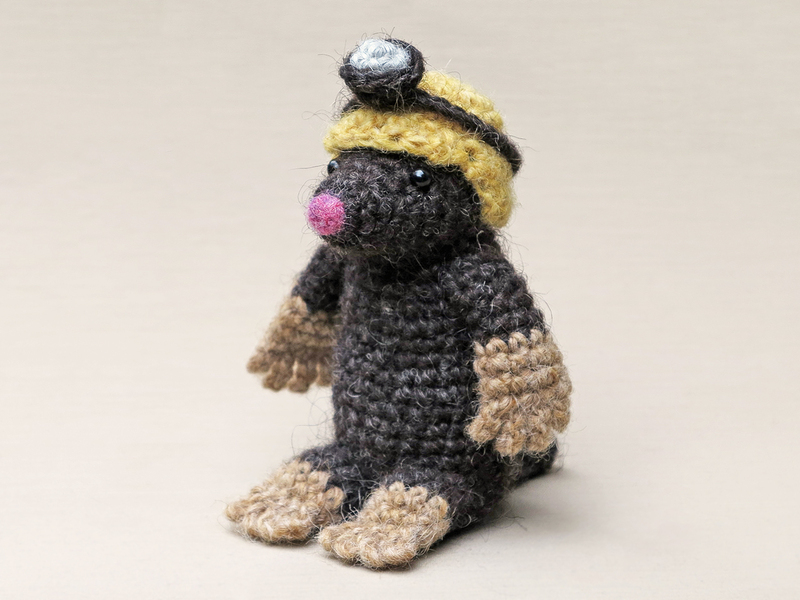 I adore them nonetheless, but I knew I had to design this crochet mole doll in a special way. To give him that extra bit of character he needed, I exaggerated the size of his arms and legs. Especially when I finished the big feet I saw what I was looking for, they made him a very funny looking crochet animal. When I started working on this crochet pattern, I was a little bit concerned about how I was going to design the fingers and toes. I had never made such shapes before but felt it was an absolute must to have fingers and toes. Surprisingly, it was much easier than I expected and fingers and toes are easy to crochet for all of us. After a year or so, I decided to make Moser a very handy accessory, a miners safety helmet. It’s something moles can’t go without. I added the miners safety helmet to the pattern, so anyone make him with the cool helmet. Here are some more pictures of the crochet mole. Below them picture you can find more info about the pattern. Info about the crochet mole pattern. Moser is 4.6 inch / 11.5 cm tall standing, when made with a worsted weight yarn. I’ve used 5 mm animal safety eyes and needle felted a very pink nose. The pattern for this cartoonish and wooly crochet mole you can find in my shop Craftsy and in my shop at Ravelry or order it here.The pattern contains a clear description of how to crochet and attach the animal with example pictures at the bottom to help you get everything right. In the pattern you can find what materials you need, the Lopi colour numbers, in short, everything you need to know to make this funny looking doll. Soms lijkt het net of je al die mooie beestjes zo uit je mouw schudt 😉 Ik ben al weer nieuwsgierig naar de volgende. De volgende …. dat wordt een vleermuis.